Title says it all. Latest builds do not work properly on Facebook. The pages partially download most of the time. Some content is rendered, other section merely display lines of code! Even when the page does load it will not scroll proper and once you scroll to the bottom where it should load another section of page.. it merely hangs up and never loads anything. Only solution is to click refresh several times. Basically, this build does not work on Facebook anymore. My machine is a G5 dual 1.8 with 8 gigs. I've also tried reconfiguring everything I can think of in system and app preferences and network to try and make this work better on Facebook. So far with no improvement. Well, this sounds unusual. I use Facebook every day and I never see these problems. Have you tried the following? Go to Help>Troubleshooting Information>Restart with Add-ons Disabled… Does this improve things? 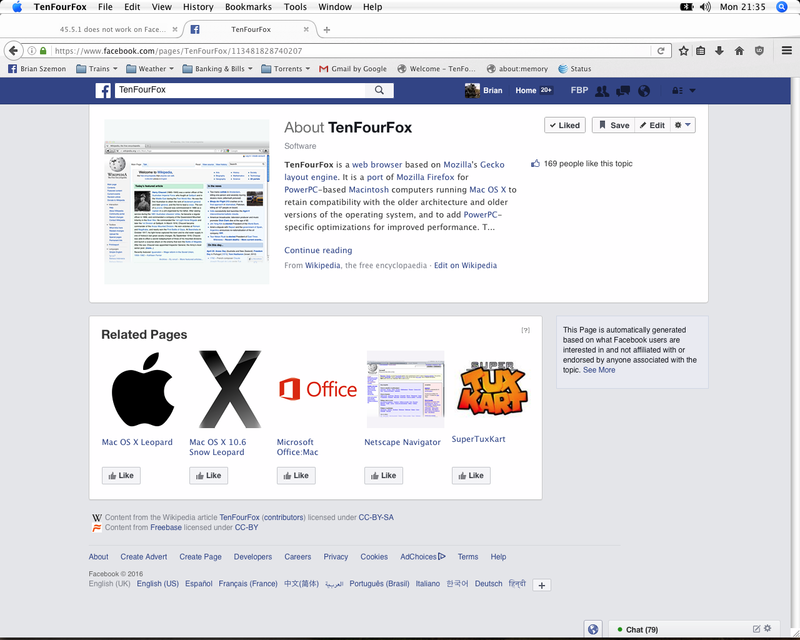 If it doesn't, you can also try "Refresh TenFourFox…". Here's a list of addons I had. I liked to keep Bluhell. eSnipe. And one of the youtube video download addons. Which ones should I delete? Facebook works ok with my G4 (7450) in 10.4.11 (Tiger) I have had page render issues with facebook but in all those cases it was on facebooks end I had to open a support ticket and eventually they fixed the problem. Shelby I can think of 2 things to try 1. open a private window, Click File->New Private Window. Login too facebook and see if things load normally if not try and open facebook in safe mode, Click Help->Restart with add-ons disabled once restarted choose safe mode and try facebook again. I'm thinking it's facebook as I'm a popular photographer and use it daily and have my page not load or load half way and once I couldn't even make a post. those and it is much faster now and browses facebook properly again. The add-ons must conflict with the newer software. Shelby, it's best to test the add-ons one by one, then conclude which one interferes with Facebook. I use none of these. For downloading YouTube videos I use 'Download Youtube Videos as MP4', which is updated regularly and has never interfered with anything.